VB-72 (6) Sound Absorption Panels Producers Choice- White- Black – 8 ft (96″ H x 80″ W) NO GROMMETS. SIX PACK. 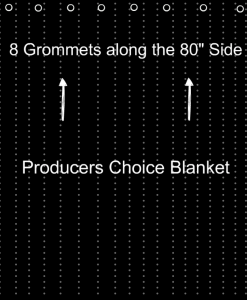 Producer’s Choice Sound Blankets are perfect for creating crisp, beautiful sound in your recordings. Producer’s Choice is not just our brand name, it’s a fact! Producers choose our blankets time and time again for soundproofing vocal booths and acoustic room treatment. No matter what coverage you need, a window, a section of wall, a whole wall, a floor-to-ceiling wall, a whole room, or even a whole house, we have got a product for you! 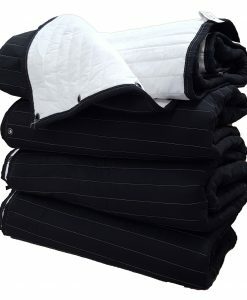 Producer’s Choice sound proofing blankets can be bought individually, by the bolt, the dozen, or half dozen. We changed the stitch pattern to a straight 2″ wide stitch design, which makes the blanket twice as thick as the Zig-Zag stitched blanket of the same weight. Increased thickness improves sound absorption and the noise reduction quality of the blankets. Colors: Black on one side, White on the other. White Thread. Woven Black Binding. Visit our Articles section to get tips and tricks on these blankets, acoustic room treatment, soundproofing and to view professional lab tests. VB-76G (4) Bundle of Studio Size Producer’s Choice Acoustic Blanket – 10ft (120″ H x 80″ W) WITH GROMMETS. FOUR PACK. 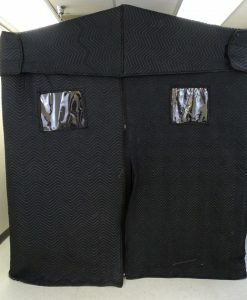 VB-71 (1) Acoustic Blanket Producers Choice- Black – 6 ft (80″ H x 80″ W) NO GROMMETS. SINGLE.